This week's Sea Song continues our exploration of country music that Jimmy Buffett didn't make famous, but will probably perform on tour some day (if he hasn't already). We were excited to have finally found Blake Shelton and his hit from 2004, Some Beach. If you enjoy it half as much as we did, you are going to love it. Have you heard about any volcanoes lately? Nope, neither have we. It seems earthquakes are stealing all the natural disaster headlines, with a little help from flooding in Fargo. Here's a lava-hot headline for ya: Our Sea Song of the Week is Volcano by Jimmy Buffett. If you think that lead-in was cheesy, wait 'til you see this 80's-style video. Still, it makes me want to be there! Oh yeah, and check out the audience watching the concert from their boats – now that looks like fun and a disaster waiting to happen, all at the same time! For our previous picks for sea song of the week, check the Daily Boater or our Sea Songs page on YouTube. Not many boat shows going on this weekend, but that is okay. 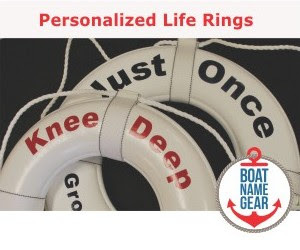 With the first full weekend of spring upon us, and most parts of the country warming up, it is the perfect time to start visiting boat dealers directly – walk their yards, browse the boats in their showrooms, enjoy the fresh air. If you have been thinking about it and it is within your means, then now is the best time to get out there and get a boat! Learn more about these and future boating events on our boat show calendar. James Taylor turned 62 today, so we chose his Boatman as our Sea Song of the Week. Of course this isn't the first JT tune we've picked. Back in 2006 we once chose Sailing to Philadelphia (with Mark Knopfler) as our Sea Song of the Week. And don't be surprised to see Mexico here some day in the future - although it doesn't actually mention "boats" or "sailing", Jimmy Buffett has turned that James Taylor masterpiece into a classic ballad for the boating lifestyle. Stay tuned! This weekend has a diverse lineup of boat shows sprinkled around the world, including DIBS, or the Dubai International Boat Show which runs through Saturday. There's another large boat show in New Zealand. The Auckland International Boat Show is touting itself as "New Zealand's biggest boating event since the America’s Cup." That is probably true. Here in North America, we've got our own large shows this weekend. 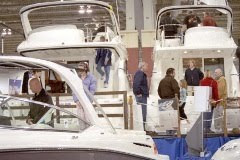 Okay, maybe not so large, but the Quinte Sportsman, Boat & RV Show does refer to itself as the "Largest Sportsman, Boat & RV Show between Toronto and Ottawa." They have no argument from us. There are also sportsman and boat shows in Biloxi, Quebec, Reno, Novi, Chantilly, and Fort Myers. Details for all on our boat show calendar. With the warm weather this past weekend here in the northeast, many boaters are tempted to break the boat out of its winter confinement and get spring started a little early. But before you launch your boat for the first time in several months, make sure your vessel is as ready as you are to get back on the water. There are several websites with checklists on how to de-winterize your boat and get it prepared for the new season, so we thought we would direct you to a few of the better guides. Check out these sites even if you are not doing the work yourself so that you can ensure that your service provider is covering all the major points. Thanks to Ericka's Powerboating Blog for reminding us this past weekend that if you prepare now, “on that first nice day of spring, you'll be ready to take advantage of the warmer weather and be able to get your boat in the water that much faster.” Ericka also has a more detailed task list to help de-winterize your boat. Read it here. 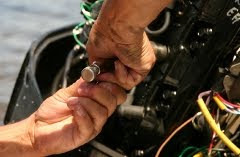 Alan Sorum’s Boating & Sailing blog has a very good article on how to prep your boat for the spring, broken into three simple sections. One of Alan’s best tips is to “Schedule yard work well in advance and avoid the rush that comes with the first nice spring day.” Remember that Alan boats in Alaska, so if these tips work for getting a boat ready after an Alaskan winter, they should certainly be helpful to those of us in the lower 48. Read Alan's de-winterizing article here. If you are more of a visual learner, this 2 minute video from Sunbrella walks you through a live checklist of items to clean, prep and check before you launch your boat each year. What is your spring ritual? Can you recommend any other good de-winterizing guides? When are you launching your boat for the season, or are you lucky enough to live in a year-round boating climate? 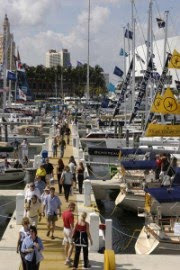 Ok, maybe there are not millions of boat shows this month, but there are a bunch this weekend. Too many to list, actually, but we'll give it a try. Where are all the boat shows? Let's just say that if you're in Denver, Orlando, Philly, San Diego or Louisville, there's a boat show of some sort near you. There are also boating events in Alabama, northern Illinois and on Long Island. 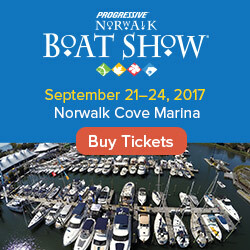 Many of these are traditional boat shows, some are quite large, and a couple are specialty shows focusing on trawlers or houseboats. American made cruisers, like the beautiful Nordic Tug 49 pictured here (courtesy of Nordic Tugs), will be on display at Trawler Fest this weekend in San Diego. Not in the US? No problem. There are boat shows this weekend in Japan, Austria and Winnipeg, too. As always, all the details about these and other fun events can be found on our boat show calendar. PlanetSolar, the world's largest solar powered yacht, was unveiled last week according to the PlanetSolar website. The Swiss-designed 102 foot boat is being constructed by Knierim Yacht Club, in Kiel, Germany, where the unveiling took place. The Star Trek-looking vessel is expected to be launched in April 2010, and travel around the world a year later according to Soundings - we're looking forward to the launch. 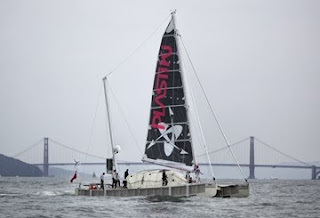 Can you imagine a day in the future where all boats are powered by either wind or sun? If this ship "takes off" then we might be well on our way. What are your thoughts of solar power for recreational boating? There is good news if you are a Costco member and in the market for a new boat. Costco and Sea Ray just announced that they have expanded a partnership they started on the west coast early last year. Depending on where you live, the promotional website states that you may receive "members-only pricing" on select Sea Rays, plus $3000 of dollars in "incentives" and a $500 Costco gift card; it also mentions you would still be eligible for other Sea Ray incentives and that this offer lasts through September 2010. If you are in the market for a new boat and happen to be a Costco member, it is probably worth your time to first get a quote as a non-Costco member. Once you've negotiated your best price it is time to whip out your membership card and see if you can actually save even more money. Feedback is welcome from anybody who has taken advantage of this or a similar offer.